Inbox just launched a feature, which to be honest, I can't really figure out the point. So after reading this, and trying it out, please do leave comments so I can better understand how this differs from regular bookmarks in Chrome (or any other browser). This new feature, called Save to Inbox, allows users to save links from apps, websites, and clipboard history directly to Inbox by Gmail. Using the mobile version (iOs and Android) when users click on the share option, they will be a new option, Save to Inbox in the sharing menu. Using desktop, a new extension has been rolled out for Chrome that provides this functionality. The extension can be found here. You will only have the option to share at the time you use the extension. 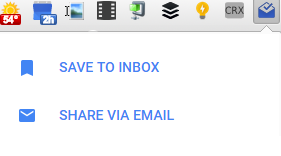 Once saved in Inbox, there is no share capability. In addition, if you don't use the extension to Save to Inbox, and instead manually copy a URL or Link, when you go back to Inbox there will be a new Link icon above the Floating Action Button (FAB) that will give you an option to share that newly copied link. I guess the benefit for this feature will be the automatic creation of a new Bundle named Saved and will keep all of these links grouped together. Another possible use case for this is if you come across news articles that you don't have time to read, you can save them to Inbox and show the bundle as they arrive, once a day or once a week to suit your needs. It should be noted that this new Saved bundle will default to show as messages arrive. You can always change that from the settings menu or the gear icon next to that bundle. Yeah I played with it today it's pretty cool. In fact it works with my clipboard app if I "activate" a link and then go to inbox, the process begins. I think it could be a good thing! I believe it's a "Pocket killer." That is, it competes with "read later" services like Pocket. I'm not sure it can compete with Pocket in my workflow, though, because Inbox doesn't support sub-folders, so it will be hard to keep organized the information saved in this manner. Inbox has made email a todo item, they've added reminders and tasks into it as well. They're doing the same for the folks that keep 25 open tabs with things that they eventually want to get to. Drop it into inbox, and then go to it, snooze it, pin it, and then Cross it off when it's done. Pretty handy when used properly. I've reduced the number of tabs that I have open SIGNIFICANTLY. I have my new saved bundle show up in the morning when I have time to read in peace. I cannot get a URL that was saved to inbox to open in clicking it. some other items I have saved there have a view button which works fine but not a straight URL.